Integrated Industrial is your one-stop resource for mining and off shore supplies, safety equipment, tools, hardware, plumbing, building supplies and general consumables. Our prime focus is first-class service to the mining, industrial and off shore sectors. Quotes returned on the same day or within 24 hours. Delivery to site in 24-48 hours! We've been supplying the mining and off shore industries from Perth for the past 20 years and currently service over 150 mine sites and off shore customers throughout Western Australia, Africa and Asia. We take pride in our attention to detail, our personal service, our efficiency and our agility. This ensures you receive your goods on time, every time. And with a sales team of 18 professionals with more than 450 years combined experience - you'll also benefit from industry-leading product knowledge and procurement expertise. What really sets Integrated Industrial apart from its competitors is our speed. Detailed quotes on the same day or within 24 hours of your enquiry and delivery to site generally within 24-48 hours! 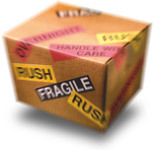 Your goods are securely packaged, clearly marked and delivered according to your instructions. We also offer pick up and delivery services within the Perth metro area. COD purchasing is also available where clients do not have an account with a particular supplier. Download a credit account application form. We have access to more than 2,000 active suppliers which allows us to source all kinds of products at extremely competitive prices. Our group purchasing power ensures you buy your mining and off shore supplies at the best available price. We can supply anything you want. Anywhere you want it. Fast. "This week I stopped by our warehouse to gain some feedback regarding the new consumables replenishment process via Integrated Industrial as we received one of our first orders a few weeks ago. The feedback I received was that the packaging was much simpler for handling purposes and has reduced the amount of time required to repackage goods. In addition, my colleagues commented on the professional presentation of the goods, especially with the inclusion of a hazardous chemicals sheet supporting the Preen product within the package. Lisa also mentioned that the new process with Integrated Industrial is simpler for her and will result in reduced processing time of orders. So overall, this new arrangement will be a big benefit to us – the small issues that were often resulting in inefficiencies here and there are no longer a frustration. I'd like to say thank you for your support and service. We have been very pleased with Integrated Industrial since embarking on the new venture." "Chirano Gold Mine started doing business with Integrated Industrial in 2011 and they have become our preferred supplier of Mining supplies and consumables out of Australia. Based in Ghana we need a company that can deliver on quality, service and price and we can vouch for the professionalism they show in handling our orders. We will not hesitate to recommend them to any other entity that might want to use their services. The team led by the Managing Director is highly skilled and capable of meeting all requirements." "I have used Integrated Industrial on a number of occasions and find their service impeccable. Nothing is too hard, the communication is always good and that is imperative in the off shore industry. I would recommend Integrated Industrial to anyone because they can get anything, the price is right and their service is second to none." "I've used Integrated Industrial for the past nine years and have enjoyed impeccable professional service and competitive pricing. On many occasions we've had difficulty sourcing obscure items and this is where Integrated Industrial, with their extensive knowledge in the mining and associated Industries, come into their own." "I have used Integrated Industrial as a major supplier for over 10 years in both mining supply and project procurement. The preparedness to go the extra yard to provide a complete service is their greatest asset. I have never been let down during this period and congratulate them on their professionalism and competitiveness in a demanding industry in which they continue to strive for continued improvement. More suppliers with a similar attitude to service would make my life considerably easier."